Hamilton (pronounced /ˈhæməltən/) (2006 population 504,559; UA population 647,634; CMA population 692,911) is a port city in the Canadian province of Ontario. Conceived by George Hamilton when he purchased the Durand farm shortly after the War of 1812, Hamilton has become the centre of a densely populated and industrialized region at the west end of Lake Ontario known as the Golden Horseshoe. On January 1, 2001 the new City of Hamilton was formed through the amalgamation of the former city and the other constituent lower-tier municipalities of the Regional Municipality of Hamilton-Wentworth with the upper-tier regional government. 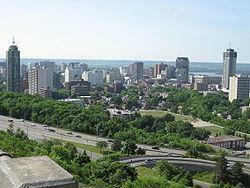 Residents of the city are known as Hamiltonians. Since 1981, the metropolitan area has been listed as the ninth largest in Canada and the third largest in Ontario. Hamilton is located in Southern Ontario roughly 70 km southwest of Toronto. Hamilton is home to the Royal Botanical Gardens, the Canadian Warplane Heritage Museum, the Bruce Trail, McMaster University and Mohawk College (Largest skilled trades college in Ontario). The Canadian Football Hall of Fame can be found downtown right beside Hamilton City Hall and across town to the east, the Canadian Football League's Hamilton Tiger-Cats play at Ivor Wynne Stadium. The Erland Lee (Museum) Home (c. 1808) is a National Historic Site of Canada on the Canadian Register of Historic Places. An Ontario Historical Plaque in front of the Erland Lee Museum was erected by the province to commemorate the First Women's Institute's role in Ontario's heritage.